© Fent et al. ; Licensee Bentham Open. A diagnosis of myocardial infarction is made using a combination of clinical presentation, electrocardiogram and cardiac biomarkers. However, myocardial infarction can be caused by factors other than coronary artery plaque rupture and thrombosis. We describe an interesting case presenting with hypertensive emergency and type 2 myocardial infarction resulting from Pheochromocytoma associated with Capnocytophaga canimorsus infection from a dog bite. We also review current literature on the management of hypertensive emergency and Pheochromocytoma. Keywords: Capnocytophaga Canimorsus, Myocardial Infarction, Pheochromocytoma, Systemic Hypertension, Sepsis,..
Myocardial infarction is frequently due to coronary artery thrombosis from a ruptured atherosclerotic plaque, necessitating early thrombolytic therapy or primary percutaneous coronary intervention (PPCI) to minimise myocardial damage. Myocardial injury, symptoms and ECG changes consistent with MI can also result from an imbalance between myocardial oxygen delivery and/ or demand which is categorized as type 2 MI . Although the decision to proceed to urgent PPCI needs to be made without delay, cases with a more unusual presentation require careful assessment to avoid unnecessary complications and overlooking important differential diagnoses. We present an unusual case of a patient presenting with hypertensive emergency and type 2 MI, precipitated by a previously undiagnosed pheochromocytoma, associated with infection from a dog bite. A 58-year caucasian male with a past medical history of hypertension and medically treated MI 20 years previously, presented to the emergency department with marked diaphoresis, shivering, mild headache, neck pain and vomiting. Vital signs on presentation included blood pressure of 205/107 mmHg, heart rate of 68 beats per minute and temperature of 36.6°C. Clinical examination revealed normal heart sounds and mild crepitations at both lung bases. Initial ECG showed sinus rhythm with ST elevation and peaked T wave in leads V1-V3 and ST-depression in the lateral leads (Fig. 1). 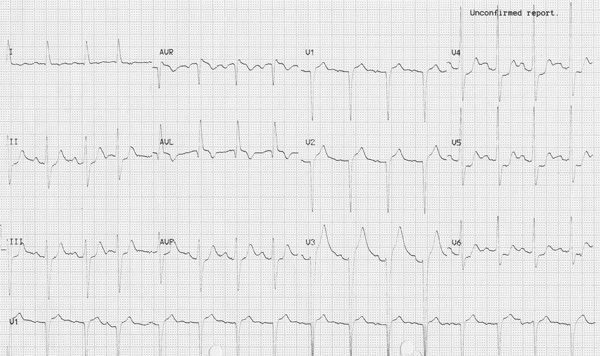 12 lead electrocardiogram on initial presentation. 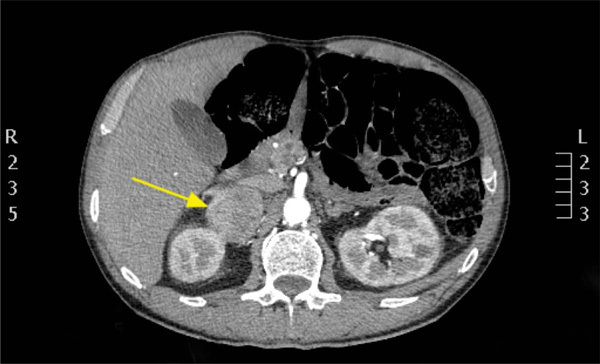 Contrast Computerised Tomography of abdomen showing adrenal mass (Yellow Arrow). 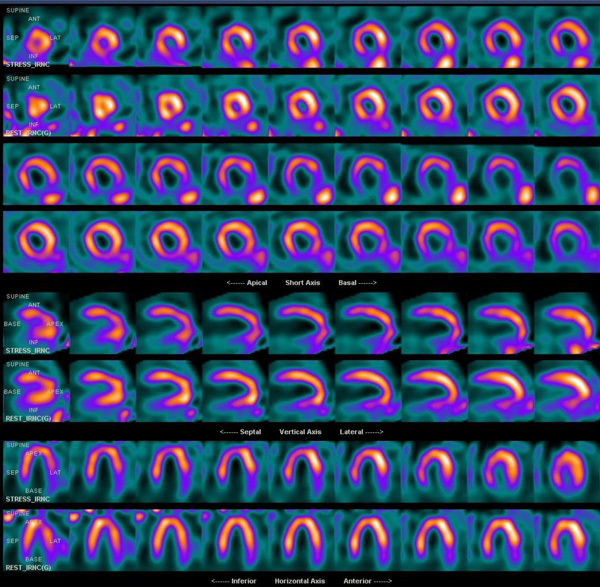 Myocardial perfusion scintigraphy showing basal inferior scaring and mid/apical inferior wall ischaemia. Invasive coronary angiography showing moderate disease in left anterior descending artery and chronic total occlusion of RCA with retrograde filling from left system. Blood pressure was controlled with intravenous glyceryltrinitrate and an immediate cardiology consult was made for consideration of PPCI. Transthoracic echocardiography (TTE) showed severe anterior and anteroseptal hypokinesia and overall moderate to severe LV systolic function. Urgent CT aortogram was organised to rule out acute aortic syndrome. This showed no evidence of aortic dissection, but demonstrated a 6 cm right adrenal mass (Fig. 2). PPCI was deferred due to his lack of chest pain, and the likelihood of his presentation being due to hypertensive emergency. Laboratory data was significant in showing neutrophils 25.8 x109 /l, 12-hour high sensitivity troponin T 2002 ng/L, C-reactive protein 477 umol/L, creatinine 205 umol/L and Gram negative rods on blood culture (later confirmed as Capnocytophaga canimorsus). A provisional diagnosis of pheochromocytoma was suggested because of the clinical presentation with hypertensive crisis and adrenal mass on CT. The endocrine team were consulted at this stage. They reviewed the patient and agreed that the most likely diagnosis was pheochromocytoma and commenced the patient on a non-selective, irreversible oral alpha-adrenoceptor blocker - phenoxybenzamine. Once postural drop in blood pressure was noted, the patient was cautiously commenced on propranolol. On the advice of microbiology and infectious diseases team he was also commenced on the intravenous antibiotic; piperacillin/tazobactam as per the sensitivities on blood culture. He began to improve over the next 5 days and on further questioning recalled having been bitten on the hand by a dog prior to his symptom onset. Subsequent diagnostic coronary angiography showed a moderate mid LAD stenosis with no significant reversal on myocardial perfusion imaging and repeat TTE showing mild LV systolic impairment Fig. (3, 4). Urinary metanephrines confirmed Pheochromocytoma and he underwent successful laparoscopic adrenalectomy two months later (Table 1). Biochemistry results of urine samples. Hypertensive emergency is defined as elevated systolic or diastolic BP (>180 or 120 mmHg respectively) associated with impending or resultant end organ damage including encephalopathy, acute kidney injury, pulmonary oedema and acute LV impairment . Treatment of hypertensive emergency should be undertaken in a closely observed environment with appropriate arterial BP monitoring and tailored according to its aetiology and the associated end organ damage . With the exception of aortic dissection where BP should be rapidly reduced, BP in patients with hypertensive emergency should be lowered gradually over the first hour with intravenous medications before instituting oral therapy . In this case, where there was evidence of early pulmonary oedema and LV impairment with suspected Pheochromocytoma; the patient was treated with intravenous glyceryltrinitrate followed by oral phenoxybenzamine. It should be emphasised that administration of beta-blocker medication in the setting of sympathetic crisis such as that caused by Pheochromocytoma, could lead to unopposed alpha-adrenergic activity and resulting in a paradoxical rise in blood pressure . For this reason, alpha-blockers should be introduced initially followed by cautious introduction of beta-blockade therapy later . Following medical stabilisation, laparoscopic surgery is the treatment of choice for Pheochromocytoma . Catecholamine-secreting tumours that arise from the chromaffin cells of the adrenal medulla are called Pheochromocytomas . The latter are rare tumours with an annual incidence of 2 to 8 cases per 1 million people . The clinical presentation with symptoms attributable to sustained hypertension as demonstrated in our case resulted as a consequence of the pharmacological action of excess circulating catecholamines. The clinical context and the imaging phenotype of a large (>3 cm), albeit unilateral adrenal lesion on contrast CT was highly suggestive of a de novo diagnosis of a Pheochromocytoma. In our patient, the dog bite resulted in overwhelming sepsis, which precipitated the Pheochromocytoma crisis with release of catechola-mines. We confirmed our diagnosis biochemically by measu-ring fractionated catecholamines and metanephrines in urine. Our patient had ECG evidence of myocardial ischaemia, LV regional wall motion abnormalities on TTE and raised high sensitivity troponin T assay demonstrating myocardial injury (Fig. 1). We felt this was most likely due type 2 MI, in this case resulting from increased myocardial oxygen demand on a background of fixed pre-existing athero-sclerotic coronary artery disease. Elevated values of cardiac biomarkers can also occur due to direct toxic effects of high levels of endogenous or exogenous catecholamines . with retrograde filling from left system. Hypertensive emergency can cause a variety of end organ damage including type 2 MI. Pheochromocytoma is a cause of hypertensive emergency and is treated with prompt anti-hypertensive therapy, alpha-blockade followed by beta-blockade and eventual surgery. As far we are aware, a case of a dog bite resulting in sepsis by Capnocytopha gacani-morsus provoking a Pheochromocytoma hypertensive crisis and type 2 MI has not been reported previously (literature searched in pubmed.gov using the following words – ‘Pheochromocytoma capnocyto phagacanimorsus myocardial infarction’ on the 3rd of February 2014). A multi-disciplinary approach involving cardiology, microbiology, endocrinology, endocrinesurgery and radiology was essentialin making an early diagnosis and implementing appropriate management of his condition. We acknowledge the following individuals for their contribution to the case management and details: Mr Barney Harrison (Consultant Endocrine Surgeon), Royal Hallamshire Hospital; Dr Jonathan Webster (Consultant Endocrinologist), Northern General Hospital; Dr William Bennet (Consultant Endocrinologist), Northern General Hospital; Dr AmitAllahabadia (Consultant Endocrinologist), Northern General Hospital. Thygesen K, Alpert JS, Jaffe AS , et al. Third universal definition of myocardial Infarction. Eur Heart J 2012; 33: 2551-67. The fifth report of the Joint National Committee on detection. evaluaion.and treatment of high blood pressure. Arch Intern Med 1993; 153: 54-83. Manica G, Fagard R, Narkicwicz Ketal. 2013 ESH/ESC guidelines for the management of arterial hypertension the task force the management of artriel hypertension of the European Society of hypertension. (ESH) and of the European Society of Cardiology (ESC) 2013. Marik PE, Varon J. Hypertensive crises challenges and management. Chest 2007; 131: 1949-62. Pacak K, Eisenhofer G, Ahlman H , et al. Pheochromocytoma: recommendations for clinical practice from the 1st International Symposium. Nature 2007; 3 (2): 92-102. Janetschek G, Finkenstedt G, Gasser R , et al. Laparoscopic surgery for Pheochromocytoma: adrenalectomy. partial resecion.excision of paraganglionomas. J Urol 1998; 160: 330-4. Lloyd RV, Tischer AS, DeLellis RA, Lloyd RV, Heitz PU, Kimura N , Eds. Adrenal tumors: introduction. In: World Health Organization classification of tumours: pathology and genetics of tumours of endocrine organs . yon.France IARC Press 2004; pp. 136-8. Stenstrom G, Svardsudd K. Pheochromocytoma in Sweden. 1958-1981: an analysis of the national cancer registry data. Acta Med Scand 1986; 220: 225-32.